New Pulp Author Barry Reese has been a noted and innovative author in New Pulp and a part of Pro Se Productions for several years. 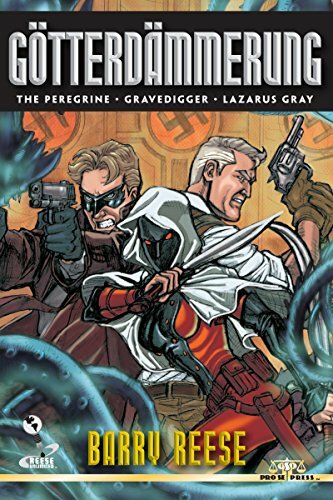 Creating characters such as The Peregrine and Lazarus Gray and finding new nuances to such Public Domain classics as Doctor Satan and the Black Terror, Reese has carved his own niche out of Pro Se in his imprint, Reese Unlimited. Now the award-winning scribe takes it up a notch with the debut of GOTTERDAMMERUNG, a novel length crossover of the Reese Unlimited universe. A terrible evil is about to be unleashed upon an unsuspecting world... and only an unlikely alliance between vigilantes, mystery men, and sorcerers has a hope of saving humanity! Award-winning author Barry Reese brings together characters from his many pulp adventure series set throughout his Reese Unlimited universe for one cataclysmic tale. Featuring The Peregrine, Gravedigger, Lazarus Gray, The Dark Gentleman, and more! GOTTERDAMMERUNG! By Barry Reese. From Reese Unlimited and Pro Se Productions. Featuring a stunning cover by Chris Batista, mind blowing interior illustrations by Mitch Ballard and phenomenal print formatting and book design by Sean E. Ali, GOTTERDAMMERUNG is available now at Amazon at http://www.amazon.com/Gotterdammerung-Barry-Reese/dp/1532858566/ref=sr_1_fkmr0_3?ie=UTF8&qid=1461771702&sr=8-3-fkmr0&keywords=barry+reese+gotter and Pro Se’s own store at www.prose-press.com for 15.00. The imprint wide Reese Unlimited crossover is also available as an Ebook, wonderfully designed and formatted by Forrest Bryant and available for only $2.99 for the Kindle http://www.amazon.com/G-tterd-mmerung-Barry-Reese-ebook/dp/B01ENZ96FC/ref=tmm_kin_swatch_0?_encoding=UTF8&qid=1461771702&sr=8-3-fkmr0 and for most digital formats via Smashwords at https://www.smashwords.com/books/view/631695.